The Data-Linc Group LLM1100 is a Bell 202 (CCITT V.23 optional) 1200 baud modem. It can be easily configured for simplex (bit mode), half-duplex and full duplex operation. The LLM1100 is designed to be used on private, leased non-switched telephone lines or any dedicated two-conductor wire (twisted or untwisted, shielded or unshielded). The LLM1100 is microprocessor-based— when the carrier shuts off, data bit errors are eliminated. This reduces retransmissions for trouble-free PLC communications. The LLM1100 also incorporates a unique data sense carrier control feature that eliminates the need for RTS/CTS control on multi-point Remotes. 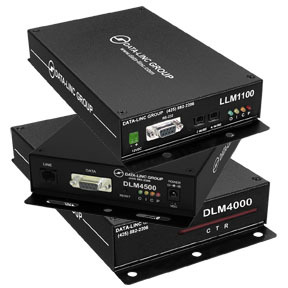 The LLM1100 easily interfaces with most PLCs, RTUs and PCs. The LLM1100 supports RS232 interface. 1 Loaded lines require TELCO VG-6 spec lines or equivalent. Line conditions, size and noise will effect overall performance. Shielded wires should not be used. Line loss between any two devices in the network cannot be more than 17dB. 2 To help with the proper application of the modems, please provide your Data-Linc Group sales representative with a detailed diagram of the proposed application.